Welcome to the UTD 2019 REU Summer Program! 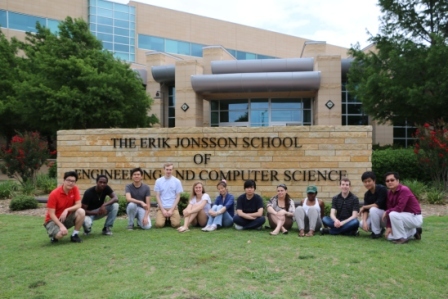 The Computer Science Department at the University of Texas at Dallas will conduct a ten-week summer research program funded by the National Science Foundation (NSF) for ten undergraduates from May 17 to July 25, 2019. The focus is on "software safety and reliability," however, the technology and skills learned by the students have general applicability to research and practice in their future studies. We provide a close collaboration with our industry partners. In addition to work on assigned research projects at UTD, field trips to Raytheon, Lockheed Martin Aeronautics Company, and Argo Data will be arranged to help the students better understand how software safety is adopted in practice for real-life applications. This also gives students a chance to directly communicate with practitioners to receive a first-hand account of the work environments and lifestyles in the industry. We also host special workshops on technical writing and oral presentation to improve students' proficiency in preparing and delivering technical reports. A highlight which provides an overview of our program including research projects, lectures, and field trips is available at YouTube. In addition, videos (along with PowerPoint slide shows) for students' project presentations as well as lectures on software safety and technical writing are also posted. Eligible applicants are those who have an interest in pursuing a graduate education, are currently enrolled in an accredited undergraduate institution or are high school graduates who have been accepted at an undergraduate institution but have not yet started their undergraduate study, and are U.S. citizens or permanent residents. Incoming seniors will be given preference, but sophomores and juniors with strong academic records will also be considered. Special welcome is extended to students from underrepresented groups (women, minorities, and persons with disabilities) and academic institutions with limited research opportunities. Selected participants will receive a scholarship to conduct research with a faculty member in the Computer Science Department at UTD. Included will be a $5,000 stipend ($500/week), a housing allowance, and a travel reimbursement for those from outside the Dallas metro area. We are grateful to the NSF and the following UTD offices for providing support to this project: Department of Computer Science, Erik Jonsson School of Engineering and Computer Science, the Office of the Vice President for Research, and the Writing Center at the Office of Student Success and Assessment. Copyrights © 2019 Design by UTD Summer REU.